On Sunday night at the Toronto Film Festival, Jonah Hill unveiled his directorial debut, the much-anticipated Mid90s, about a shy, lonely 13-year-old in L.A. who bonds with some local skateboarders. When the film was over, Hill came on stage to a standing ovation from the crowd, which moved the Oscar-nominated actor to tears. This isn’t an uncommon occurrence at a film festival — the standing ovation, I mean, not the crying — and it’s one of the things that makes people who don’t go to festivals roll their eyes. Because these spontaneous displays of affection occur so often, they feel manufactured, preordained. But whatever you may think of the audience’s response, Hill’s tears were absolutely genuine. In some ways, the 34-year-old star has been building to this moment for a while — not just his directorial debut but the opportunity to be respected as a serious artist. I wasn’t at the premiere, but I suspect those tears came from a place of recognition: Maybe he’s finally gotten where he always wanted to be. Much has been made about the transformation Hill has undergone over the years from the burly, rude kid in Superbad to a guy who works alongside major talents like Martin Scorsese (The Wolf of Wall Street) and Brad Pitt (Moneyball). The switch was so severe that he even made fun of it in This Is the End, playing a (presumably) exaggerated version of himself as a snobby artiste who had outgrown his stoner buds. But the reinvention didn’t end there: He’s now respected as a style icon and been honored with his very own day in Brooklyn — which Hill attended this year. Plus, he seems intent on readjusting his relationship with his fans, coming across as genuine and humble in a July appearance on The Jimmy Kimmel Show in which he talked about doing projects that bring him joy and showing love to hip-hop artists he reveres such as Kanye West and Nas. For being as famous for as long as he has, Hill came across as a very chill, down-to-earth dude. With all of Hill’s attempts to shed his previous funny-guy persona, it would make sense that he would bring his passion project to Toronto. The festival, which began in 1976, is an overwhelming experience, screening more than 400 movies over the span of about two weeks. It’s a launching pad for awards season, and it features some of the most supportive crowds at any major festival. People come to Toronto not just to see what films will be part of the Oscar conversation but to cheer them on. Unlike Cannes, where bad movies (and even some great ones) get eviscerated by journalists who have their knives out, Toronto is safer and more receptive. In that regard, the nostalgic, vulnerable Mid90s was a perfect Toronto premiere. Like a lot of first-time films, Mid90s comes straight from the heart. Hill, who also wrote the movie, introduces us to Stevie (Sunny Suljic), who reveres the older skateboarders like gods. The filmmaker was himself a skateboard kid growing up in Southern California, making videos and devouring the magazines and the culture. And like Stevie, he wasn’t particularly good at skating — he just loved the scene. (“I would say dedication-wise I was 100 percent, but skill-wise 14 percent,” Hill recently told Vulture.) In Mid90s, Stevie feels like he’s finally found a community, but he soon learns that this community has its own problems — and that running away from his real life won’t entirely work, either. Anyway, Hill’s tears quickly became part of the story of Mid90s’ premiere. They spoke to the long road he’d gone on to get to this point in his career, but it’s also the kind of moment that makes film festivals special. In particular, it reminds me that films are made by human beings to be seen by other human beings. In that way, we all have a vested interest in movies being good. Here are a few other takeaways from this year’s Toronto Film Festival. #1. The volunteers in Toronto are incredible. The promotional video that honors them is not. Film festivals don’t run without volunteers. Before a fest, a team of programmers and administrators put together the slate and coordinate endless logistical concerns, including airfare, accommodations, red carpets, ticketing and numerous other headaches. But once the festival gets going, the volunteers become the backbone and central nervous system, keeping screenings running on time and answering dozens of questions from panicked, rushed critics and festivalgoers. This requires infinite patience and sympathy: A volunteer is a combination of den mother, traffic cop, babysitter and therapist. It’s impossible work, and I’m always amazed how good they are at it. The Toronto volunteers are especially excellent, which is impressive considering what a large festival it is. There’s a cliché that Canadians are super-friendly, but it’s pretty true around the festival. And it’s especially true for the crowds at public screenings, who give the volunteers the most boisterous response before each film to thank them. Enduring that only underlines how patient and good-tempered the Toronto volunteers are. They’re not getting paid, and they’re battling wind, rain and petulant festivalgoers. They deserve better than these dumb videos. #2. Nothing scares Toronto festivalgoers — except that one escalator. One of the festival’s greatest dramas each year has nothing to do with what happens on the screen. Instead, it involves getting to the screens themselves. Most of the press and industry screenings at the Toronto Film Festival take place at the Scotiabank Theatre, a 14-screen multiplex that, for two weeks, is devoted entirely to the most promising, adventurous and award-hungry movies. If you want to see those movies, though, you have to really want it — by which I mean you have to get up to the second floor, where the theater is. And to do that, you have to brave an incredibly steep escalator — or, if you’re unlucky, the stairs. And most people who go to the festival will, at least once a year, be unlucky, because that escalator breaks down all the time. I consider myself a relatively fit human being. But those stairs give me nightmares. 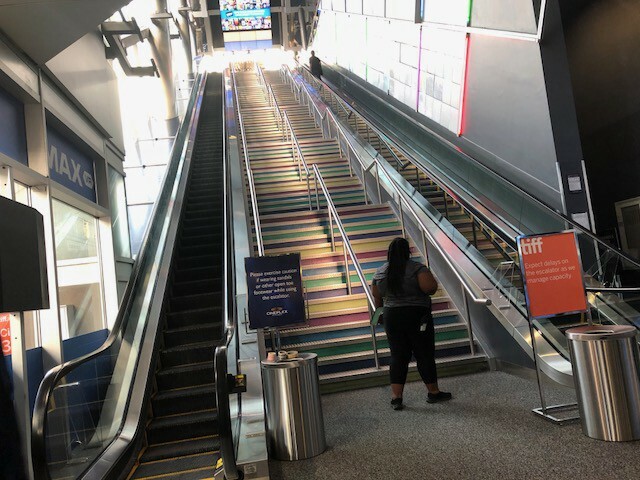 And I’m not the only one: It’s now an annual tradition for out-of-town film critics, a couple weeks before the festival, to start checking on social media with Toronto locals to see how the escalator is holding up. And what we’ve learned is that the damn thing is always broken. Film industry professionals: We’re fascinating conversationalists. We’re also terrified of physical activity. #3. Leave Barry Jenkins alone, dummies. The same night that Mid90s made its debut, writer-director Barry Jenkins premiered his follow-up to Moonlight, If Beale Street Could Talk. (The movie’s pretty great, by the way.) It must be good to be Jenkins these days: He’s an Oscar-winner responsible for one of the most beloved movies of recent years. And he got a rousing welcome before Beale Street screened and after it. People love the dude. To provide a little context, Widows (also terrific) is the new film from 12 Years a Slave director Steve McQueen, which is also screening in Toronto. McQueen is black. So is Jenkins. And some bozo got them confused. So, as a public service, let’s make sure you know the difference between the two guys. Dude on the left is Steve McQueen. Gent on the right is Barry Jenkins. Stop getting famous black people confused, folks.